Be the first to hear about their new releases and deals. 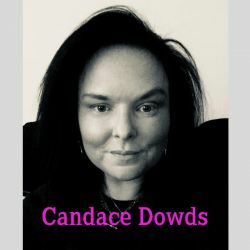 Download the Booksprout app and search for Candace Dowds today! Candace began writing after the passing of her son in 2009. It has been an emotional release for her. She is supported by her family and friends. Other than the time she is writing, she sits back for hours reading books by her favorite authors, Tijan Meyer, Rachel Vincent, Richelle Mead, Colleen Hoover, Claudia Gray and so many more. That or she will go for a calming drive while listening to Eminem, Slim Shady, Marshal Mathers or The Rap God, whichever you would like to call him. Her kids are just like her, sarcastic, but fun loving. The rules she lives by 1 Don't take life too seriously 2 Don't live up to others ridiculous expectations 3 Surround yourself with people who love you for you 4 If life becomes too much, have a stiff drink and start again tomorrow.